130 mm/50 B-2LM3 х 2 pcs. 180 Degree Turn Time18.56 sec. 12.7 mm DShK6 х 1 pcs. 37 mm 70-K6 х 1 pcs. 76 mm 39-K1 х 2 pcs. 12.7 mm DShKM-26 х 2 pcs. Nicknamed "The Blue Cruiser" despite being a destroyer due to her being larger than a contemporary destroyer and alluding to her historical paint being Cobalt Blue, the Tashkent was much maligned in her previous Tier VIII incarnation. Fortunately, the Tashkent received a package of buffs resulting in a quite serviceable ship even at her new home at Tier IX. Tashkent retains the excellent guns and speed of Kiev, and, while significantly larger and less maneuverable than Kiev, her generous hit point pool and edge in range (up to 15.2 km with module and Advanced Firing Training) goes a long way towards making up for it. On the offensive side, fast-reloading torpedoes and access to the last upgrade slot are welcome advantages. Finally, the Tashkent also introduces the intriguing option of replacing her Smoke Generator ( ) consumable with Repair Party ( ). Both are viable; while the value of smoke in getting out of bad situations and supporting the team is obvious, the sheer longevity provided by Repair Party cannot be denied either. In contrast to the traditional destroyer role, Tashkent should primarily be played at long range, where enemies will have trouble hitting it despite its large size, while the Tashkent’s high-velocity guns can still hit the enemy. That said, Tashkent will still often find herself pressed into more traditional destroyerly duties such as screening, baiting, and capturing points when there are no better ships available for the job. Here her torpedoes should not be ignored; while they are merely mediocre, they reload quickly, making them a good option for preemptively firing into chokepoints or smoke whenever an opportunity presents itself. Large amount of hit points for a destroyer. Torpedoes reload quickly compared to other high-tier destroyers. Gains access to the Repair Party ( ) consumable (by giving up Smoke Generator ( )). Terrible camouflage values for a destroyer, making scouting a risky proposition. Large size, almost the same size as a light cruiser, making you easier to hit and as a result take increased damage from all sources. Torpedoes have the same range as the Kiev torpedoes, and have better damage and speed, but with 1 less torpedo per salvo. Main battery-wise, the only upgrade from the Kiev to the Tashkent is marginally better firing range. The Tashkent has four modules to research. The main battery or the hull should be researched first. If researching main battery the traverse speed of the turrets will be doubled. As an always moving, always dodging shots destroyer, traverse to fight back is very important. The hull is an upgrade as equally important for the survivability of the boat on the long term in battles, as the un-upgraded rudder shift is even more painful than missing the last 10% of range, not to mention the other benefits of the hull upgrade. The range should be researched third, and then finally the torpedoes. Slot 1: Main Armaments Modification 1 ( ) as keeping the guns firing is a huge part of the ship's play style. Slot 2: Propulsion Modification 1 ( ) as it relies heavily on its speed as a secondary defense to incoming enemy shells. Slot 3: Aiming Systems Modification 1 ( ) for better accuracy on long range targets. Slot 4: Steering Gears Modification 2 ( ) when stacked with Steering Gears Modification 3 (seen below), allows for having rudder shift much like a USN destroyer. Slot 5: Steering Gears Modification 3 ( ) as the concealment is already poor even without firing and as aforementioned, this allows you to evade shells even better by having rudder shift similar to a USN destroyer. Captains who have one of the rare Engine Boost Modification 1 ( ) upgrades and have the Sierra Mike ( ) signal equipped are encouraged to replace the Propulsion Modification 1 upgrade, as it extends the Engine Boost ( ) consumable duration by 50%, thereby allowing her to maintain a max speed of 48.2 knots for three minutes. Tashkent is a gunboat destroyer through and through. Therefore, skills boosting her gunnery are much appreciated. At her core a captain should spec for Priority Target, Last Stand, the captain's choice of either Basic Firing Training, or Superintendent, and finally Advanced Firing Training. Level 3 of the skill tree is where choices need to be made in her skill selection, as there are four skills are extremely useful and viable forTashkent. Captains have the option of taking Survivability Expert, Basic Firing Training, Demolition Expert, and Superintendent. Generally, the recommended route is to take Basic Firing Training, Demolition Expert, and Surviability Expert. The second slot will really define how the captain plays this ship. The smoke provides the standard utility of team cover, retreating, and smoke firing. However repair offers a unique playstyle giving captains a survivability increase to assist their gun-fighting capabilities. 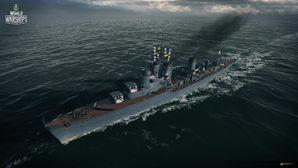 Players who wish to spend doubloons can equip Tashkent with Type 19 camouflage that lowers her detection radius, reduces the accuracy of incoming shells, reduces her repair costs, and increases the amount of experience she earns. Since Tashkent is a gunboat destroyer with excellent fire starting guns, flags such as Victor Lima ( ) and India X-Ray ( ) are great for boosting the fire starting capabilities of the ship. Alongside them, the Juliet Charlie flag ( ) is great for keeping the ship from having a quick trip back to port due to a detonation. Sierra Mike ( ) is a great choice for assisting the ship in dodging incoming shells, as this increases her speed. The Tashkent class was a planned series of 10 destroyer leaders built by the Italian company Oto Melara for the Soviet navy. Due to the outbreak of WWII, only the first ship, Tashkent, was constructed. She served in the Black Sea fleet for three years before being crippled by dive bombers. Her turrets were salvaged and transferred to Ognevoi. Tashkent running trials without armament. Tashkent at sea with guns trained to starboard. Tashkent breaking a wave across her bow. Tashkent at anchor with a submarine alongside. This page was last modified on 16 February 2019, at 03:04.